Tire temperature gives you "fingerprints" of how a chassis is utilizing traction at each tire. 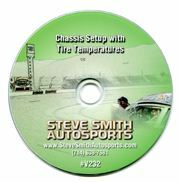 This DVD shows you how to use those temperature patterns to analyze chassis problems and improve lap times. 45 minutes.